Hey Anne-Laure, first of all, can you tell us a little bit about yourself and what you are working on? I’m originally from Paris but lived in quite a few cities, including New York, Tokyo, and San Francisco. I’m now living in London. I used to work at Google where I was managing marketing for several digital health products, and left the company two years ago to start my own thing. I’m currently running Ness Labs, which is basically a blank canvas to create cool stuff and see what sticks. You launched Maker Mag a couple months ago. How did you get your first users to the site? Being active in the maker community really helped in launching Maker Mag. It started with a single tweet which seemed to resonate with fellow makers. The idea was to create a participatory magazine that would cover products, but also other topics that matter to makers, such as wellness and productivity. Without much more work, we got about 40 writers who volunteered to contribute content for the magazine. When we launched on Product Hunt, having such a big group of motivated people behind the platform was probably the biggest drive in acquiring our first readers. Maker Mag ended up being #3 product of the day with 700+ upvotes. What tools are you using to build Maker Mag? 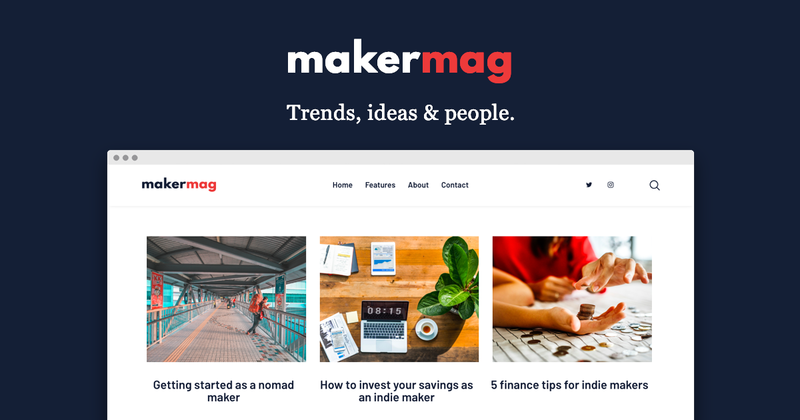 Maker Mag runs on Wordpress as our CMS. It’s a bit clunky and I wish there was a more light-weight platform for collaborative publications, but it is the one with the biggest developer community and it offers lots of different plugins and themes to play with. In terms of working together, we use Notion for our knowledge base, and Slack to brainstorm, discuss, and review articles. Everyone submits their articles in a Google Doc so we can all comment and edit them in a transparent way. Maker Mag is an online magazine with a lot of contributors - how do you reach out to potential writers? Reaching out to potential contributors is currently a very organic process. I read a lot of content about entrepreneurship and building products, and I reach out to other makers when I notice an interesting story, or someone who blogs regularly about topics that would be relevant to the Maker Mag community. We also make it very clear on our website, on social media, and in our newsletter that we are a participatory publication that’s open to contributions. This way, lots of writers end up reaching out directly asking how they can get involved. It is still early, but what SEO strategies have worked for you so far? We use a Wordpress plugin to optimise our content as well as meta-tags to improve our SEO. So far, it’s been working well, with several articles ranking first for niche queries that are very relevant to indie makers. It also helps that we have several contributors who are also content marketers by day and can help inform our strategies. Talking about content marketing - any plans for Maker Mag and do you have any recommendations for makers building an online magazine? We’re constantly experimenting with different content formats. For example, I’m very excited about our podcast – we just released our second episode and it’s been doing great in terms of engagement. We also try to produce more long-form content, which in general is doing better on Maker Mag. In the future, we want to explore ebooks and videos. The idea is to create a 360º experience so makers can consume content that matters to then wherever they are. Make it personal. Forget about automation, or thinking at scale. I think social media is also very important for growing Maker Mag - what strategies are working for you? It’s true that social media has been instrumental in growing Maker Mag. Posting consistently on Twitter accounts for a big chunk of our traffic. We keep the tone conversational and we always think community-first. This means always making sure to tag the contributors as well as any other makers mentioned in the article, so they can see they’ve been featured and can re-share with their own audience. Social media is also a source of content for us: we post polls and surveys, and use the results to create reports about the indie maker community. Overall, Twitter has been a great platform to connect with our audience. What advice would you give someone to acquire his first 100 customers? Make it personal. Forget about automation, or thinking at scale. Reach out to your potential users one by one, talk to them, try and understand what really makes them tick. It will be painstakingly slow sometimes to do all of this manually, but it will pay off in the long run. The difference between a company that succeeds and one that doesn’t is often how well they actually understand their respective customers. Share 👉 "Building an online magazine"
Want to discuss our latest Insights like Building an online magazine?